LED Aluminium caps for LED bulbs. We have achieved expertise in catering to the requirements of our clients exactly as per their specifications. We emphasize on stringent quality standards in order to ensure that the products provided to our clients is always optimum to its level. we have manufactured bulb caps in alluminium and on order make in brass nickel plating. type available are B22 , E 14, E 27. PRODUCTION QTY WILL BE LOW AND CAN BE INCREASED AS PER REQUIRMENTS. Made of high quality raw material, this Nickel Bulb Cap will last for long. We deal in LED Bulb Cap. We are manufacturing Alluminium Cap for C.F.L. 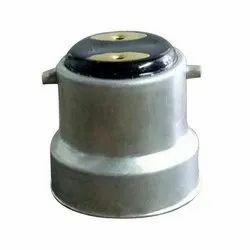 We are the leading manufacturer and supplier of Two pin metal cap for bulbs in Delhi NCR, India. These are specifically manufactured using finest grade raw material, advanced machines and in compliance with set industry standards. Our company has earned recognition for providing top quality B22 Cap for sale. Highly popular among customers these products are designed by our deft production team using innovation and experience.